My name is Won Beom Kim and I am the CEO and founder of Blocko. Today, I am happy to share that the Aergo mainnet is live and the genesis block has been produced. Rather than Phil Zamani breaking the news of mainnet to you today, it only seemed fitting that I would do so in order to explain the long journey that we’ve been through to get to mainnet. Here’s the story of how Aergo originated. In the beginning of 2014, a startup named “CloudWallet” was founded. The startup had two products to offer. The first product was named “CloudWallet”, a bitcoin wallet that was supposed to be easy to use. The second product was named “Coinstack”, a backend infrastructure and middleware responsible for powering the wallet. The infamous Mt. Gox crash seemed to have a lasting effect on the early crypto scene in 2014 and soon the startup named CloudWallet had to find new venues for survival. I built the first iteration of Coinstack in order to emulate blockchain.info. The challenges associated with building a multi-user Bitcoin wallet forced me to either adopt electrum servers, depend on the propriety blockchain.info, or create my own middleware responsible for syncing with, indexing, and querying Bitcoin blockchain. So Coinstack was born. Although Coinstack was built to support our wallet infrastructure, being a distributed systems researcher and developer with a background in database systems, I never intended to keep focusing on the wallet product itself for a long time. Google’s Spanner database, making use of Paxos distributed consensus algorithm, had been published in gory detail just two years earlier in 2012. But even with Google’s mighty R&D capabilities, distributed consensus using the proven Paxos algorithm only scaled to perhaps less than a dozen nodes. On the other hand, Bitcoin was already operating with thousands of nodes for years. So perhaps, could Blockchain be the future of the distributed consensus algorithms and responsible for building new wave of distributed systems? In 2015, we changed our name to “Blocko” and started to focus on Coinstack, as a product for enterprise blockchain. Building an enterprise product was actually pretty easy for me, because I knew what enterprise software looked like. While startups were running on REST APIs and HTML5, enterprise developers still depended on Java and Java SDKs. By 2016, we already secured a number of customers. We even delivered our Coinstack suite to KRX, the central stock exchange in Korea, who used our software to build their own blockchain-based OTC trading market (BTW, still operational at https://t-ksm.krx.co.kr/main/contents) and Samsung Card, South Korea’s largest credit card company. In early days, some customers were just happy to experiment with the technology, and focused on simpler business models and use cases. For those kinds of use cases, OP_RETURN on Bitcoin blockchain with its ample 80 bytes storage was good enough. With Coinstack 3.0, with our support for Smart Oracle architecture, virtually any business model built on top of DLT concept was able to be realized. Then we realized a curious demand from customers. Having worked with dozens of enterprise customers, we realized that they are interested in a number of new technologies, not just blockchain. It sounds very obvious, but we realized that utilizing a secure, trustless computing architecture provided by blockchain was opening up new possibilities for usually very conservative enterprise IT. For example, we realized that there’s a strong demand for running blockchain on cloud. I’m not just talking about generic Blockchain as a Service products. Coinstack 1.0 was already built on the idea of Blockchain as a Service. A lot of enterprise customers are looking at blockchain as their “way out ticket” from their rigid enterprise IT limitations. It makes little sense to run Oracle or MSSQL on AWS, but running blockchain does. There is a lot of discussion going on about introducing serverless and utility computing to enterprise, but without a strong force for transformation like blockchain, it would be very difficult to implement that in reality. So we realized that we needed a new version of Coinstack with a support for serverless computing and it seemed that smart contracts were good ways to implement serverless “lambda” functions on distributed architecture. Another peculiar interest displayed by enterprise customers is their tendency to come back to public blockchain over and over again. In 2014, we had to stop talking about public blockchain altogether. With Mt. Gox crisis, it was almost like a forbidden word. In 2017, the enterprise IT people were looking at new public blockchain technologies like IPFS and DAG. Permissioned blockchain movement in 2016 lowered the barrier for adoption of blockchain, while the new advancements in public blockchain space in 2017 excited a lot of people. People were talking about token economy now, and enterprise blockchain was no exception. We needed a new product, that was not only fast and flexible, but with a support for token economy as well. So Coinstack 4.0 project was started. By 2017, I was no longer the head of R&D in Blocko anymore. Earlier that year, Hun Park, the current CTO of Blocko and Aergo, joined Blocko. Back then, early ideas about Aergo were being formulated in my head, and the pitch was my way of explaining what Aergo would be about to Hun, who was a database systems guru. Our very own skunkworks team for Blocko was formed by Hun and we started researching the next iteration of Coinstack. In 2018, I created the first description of the to-be product, in the form of Aergo whitepaper, and Hun and his team started working on the implementation. We realized that we needed a fully-featured public blockchain network for Aergo to be successful and one of our advisors, who happened to work on cloud computing at Deutsche Telekom, proposed the idea of forming a crypto foundation for bootstrapping the birth of the Aergo mainnet. Hence, Phil Zamani started working as the chairman of Aergo. So the journey had started. We launched the Aergo testnet in December 2018. 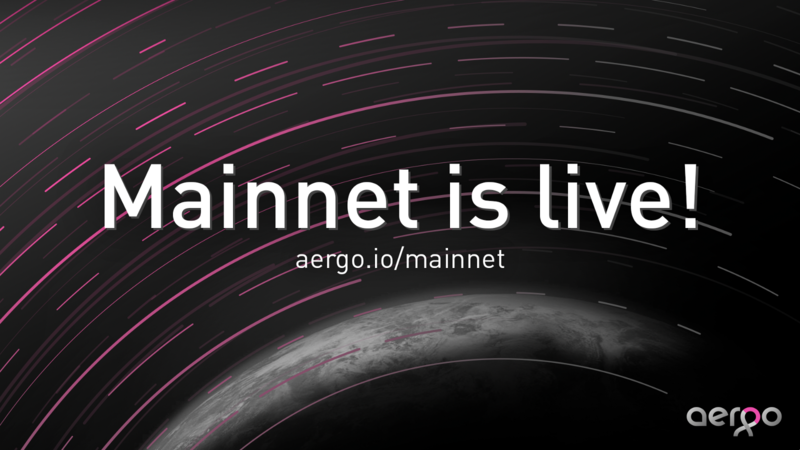 Today: after 1665 GitHub commits, countless hard hours of work from our 50+ man R&D team, and many months running our testnet; we have launched the Aergo mainnet. The development journey: building Aergo as one of the few blockchains built from scratch. The Aergo project just started last year, but our journey actually began 5 years ago in 2014. We are in the middle of our journey for greatness. If you would like to check out our network, we have a neat monitoring tool called Aergo Scan at www.aergoscan.io. If you would like to learn more about the launch, we have an article with all the essential information about mainnet here and another one here. If you are a holder of ERC-20 Aergo tokens, you do not need to do anything yet. A token bridge will open up in the summer of 2019 to transfer your tokens to mainnet if you want to stake tokens or use the network, though the ERC-20 tokens will continue to be used for exchanges. If you are looking to stake to earn rewards, you will have to wait for further announcements. Aergo’s tech committee has already made a proposal for voting rewards, and will announce further details at a later time. The network at launch will begin in an Incubation phase. Incubation phase goes on until the network stabilizes with the initial 13 block producers (not named as of yet). After Incubation, we accelerate and add another 10 block producers in our Acceleration phase. Thereafter, the network is in its intended state and a set of new public functionalities such as the DAO are enabled. We will have a launch event here in Seoul, South Korea; where Aergo was born in its early stages in 2014, on April 17, 2019. It will be a joint event between the Aergo Organization and Blocko Inc. There, the Aergo Organization and Blocko intend to unveil some new information that acts as critical news to the future of the Aergo project and its ecosystem and future use cases. This may include thing like some of the services and applications that will be built on Aergo and who will be participating in the network. There will be more news released throughout the course of the Aergo Organization’s April 2019 marketing campaign relating to these items and more thereafter. We are working on a lot of things to make Aergo not just a success, but something that drives the industry forward. Our number one goal is to satisfy our customers. Aergo is being built for the benefit of real business users and developers, and stakeholders participating in the Aergo ecosystem only gain as a result of that usage. While we have come a long way, we have a long road ahead of us. Blocko continues to actively support the Aergo Organization. We continue to build and support Aergo and will continue to jointly iterate on our roadmap detailed here. Stay up to date on everything by following the aergo.io/mainnet webpage, where we continue to share more information about Aergo with our community. Most of your questions regarding launch will be answered in this blog post. For anything else, you are welcome to join our community channels and inquire for more.